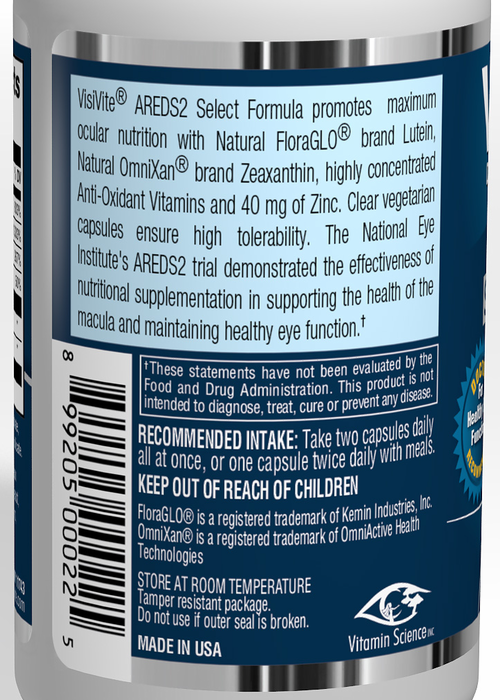 All-Natural gentle zinc AREDS2 eye vitamin for macular health is made with premium all-natural ingredients and vegetarian capsules. The AREDS2 preferred zinc salt, zinc oxide, continued to be an important ingredient in the overall formula's success. 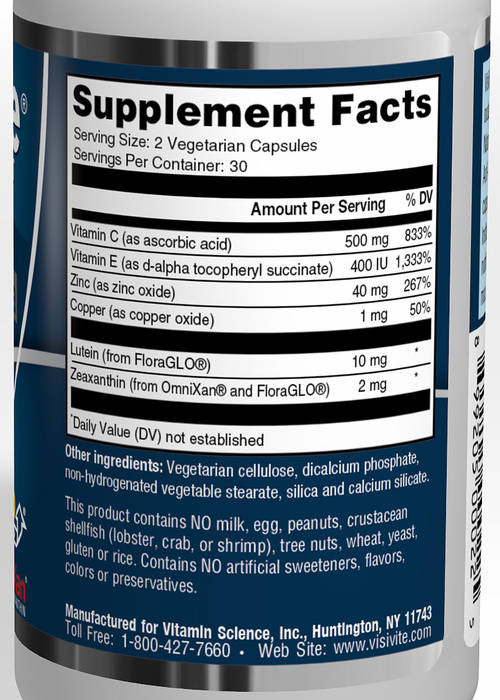 AREDS2 found NO SIGNIFICANT DIFFERENCE between gentle low dose zinc and high dose zinc in the formula's success. 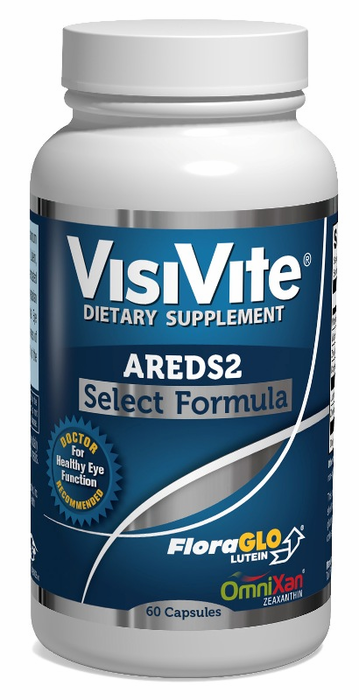 VisiVite AREDS2 Select Formula contains high levels of Lutein and Zeaxanthin, Vitamin C, Vitamin E, Zinc and Copper, just as recommended by this latest research. NO EGG or its derivatives, such as yolk, egg white, egg protein isolates, etc. 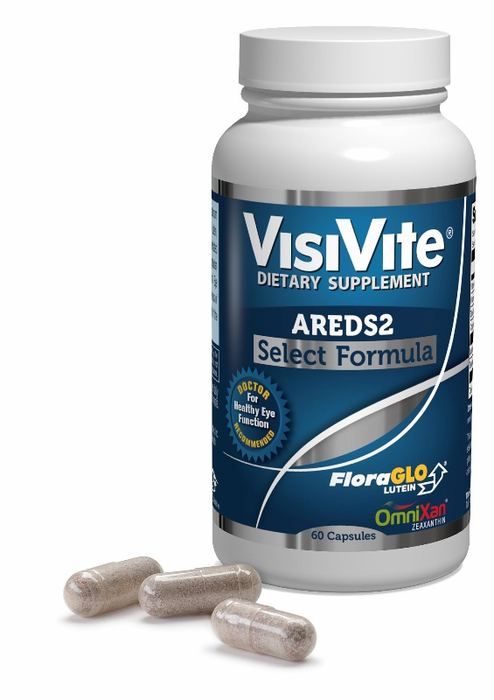 Formulated in response to requests from doctors who wanted an AREDS2 formula but with less than 80 mg of daily zinc, VisiVite created AREDS2 Select Formula. Made with 40 mg rather than 80 mg of zinc oxide for reduced gastrointestinal upset and better tolerability. And according to the AREDS2 research from the National Eye Institute, there was NO SIGNIFICANT DIFFERENCE between high zinc and low zinc formulas in their success in supporting the health of the retina in age related macular degeneration. I have used VisiVite AREDS and AREDS2 Select vitamins for the last 10 years. I believe that their use has been the major reason for slowing the dry version of age related macular degeneration in my eyes. For the last two years, there has been very little if any increase in my AMD. I also have been very pleased with the consistent timeliness of the shipping of the vitamins. In the past 10 years, the vitamins have always shipped on time and have been packaged to prevent any loss during shipping. No small achievement! Yes, the vitamins are relatively expensive. And yes, it is a hassle to have to take two capsules every day for the rest of my life. On the other hand, I will gladly keep on taking them to keep my eyesight from deteriorating any further! Visivite Select is for my husband. It seems to be controlling the progress of his Mac Degen well. Thank you! I ordered the vitamins for my husband because of his macular degeneration in his left eye. I wanted to make sure to do everything possible to help improve his vision there because he also has recently had a cornea transplant in that same eye. All my hopes for his vision return have come true now because at his last vision test, he could read with just that eye from a card without any reading glasses. I am amazed!